Wireless networks can be fantastic - eliminating the need to trail Ethernet cables across our homes just to connect to the internet, or stream media from one PC to another. But often their Achilles' heel is range. Stray too far from your wireless router and you'll soon be faced with a huge drop in speeds and stability, and finally no connection at all. The Netgear WN3000RP Universal Wi-Fi Range Extender promises to alleviate these problems by connecting to your existing network and then giving it a boost to reach further afield. Setting it up is very easy - we just plugged it into a wall socket and used WPS (Wi-Fi Protected Setup) to connect our test router to the extender by just clicking the WPS button on each. Its claim to being universal is true, for the most part - we had no problems connecting this up to a non-Netgear router. 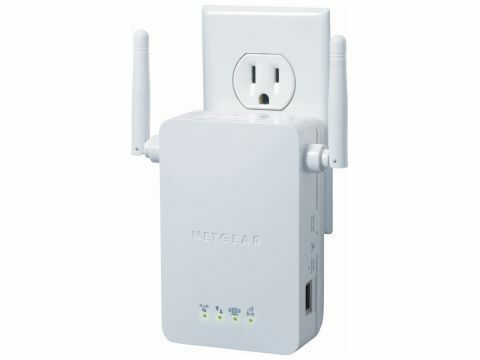 WPS support can be somewhat flaky with some older routers, however, and without WPS, set up is a slightly longer affair, becuase you'll need to connect a computer directly to the extender's wireless network. Deciding where to place the extender is a bit of an inexact science, and can pose problems for some. You need to find a spot where your existing Wi-Fi network's range begins to wane - but it still needs to be able to get enough signal in order to boost it. The Netgear Universal Wi-Fi Range Extender doesn't come with much help in this regard, so installation may result in a case of trial and error. It doesn't help that a strange design choice has resulted in the extender's body being situated below the plug socket. This could result in the extender being awkward to install if your home's plug sockets are close to the floor. The Netgear WN3000RP Universal Wi-Fi Range Extender does what it says on the tin: it extends a wireless network that it'sattached to. But there are a few weird design choices that sometimes make this device frustrating to use.